Vertical concrete overlays can provide a new decorative finish to existing walls and other vertical surfaces. Mainly applied to existing concrete substrates, vertical wall mixes can also be applied to drywall, cement board, masonry, and brick. Create the appearance of natural stone, wood, brick, and masonry using vertical stamping tools, vertical texture & joint roller tools, or by hand carving a unique stone design. Vertical overlays are colored and stained using integral concrete color, acid stain and water based concrete stain. 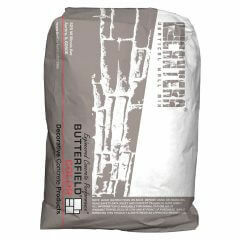 Butterfield Color® is pleased to introduce the Cantera® vertical wall systems. This system consists of Cantera® Vertical Wall Mix and the Butterfield Color® Vertical Wall Stamping Tools and Texture Rollers. The stamping tools and vertical texture rollers are designed for use with Cantera® to create the look of natural stone. 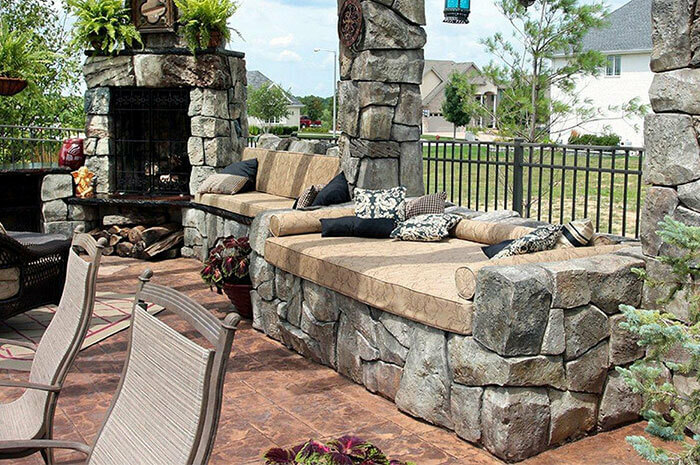 Once stamped and colored, the cured material creates a durable, natural looking and weather resistant surface that resembles natural stone. A polymer modified, cementitious overlay that is a lightweight and sag resistant material suitable for indoor and outdoor use. A precise blend of graded aggregate, cement and polymer which allows for thin to moderately thick application: 3/4 inch (19 mm) minimum to a maximum of 2 inch (51 mm) in a single application. Multiple applications are possible if a thickness over 2″ is desired. Available in 35 pound (15.9 kg) bags, mix one bag with 1.75 – 2.00 gallons (6.6 to 7.5 L) potable water water for coverage of approximately 11 square feet at 3/4 inch (1 m2 at 19 mm) thick. Available in a medium gray blend with a wide range of color options available by adding Uni-Mix® Color Packs prior to mixing. T1000® Primer and T1000® Fine Overlay are used to prepare the substrate and create the scratch coat.